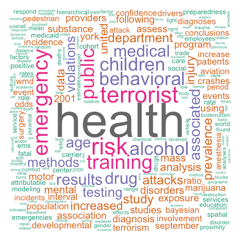 A word cloud of PubMed abstracts associated with this site. Created in R.
Much of the work presented on these pages was made possible throught the support of Centers for Disease Control and Prevention grants K01 CE000494 and R21 CE001816-01, and the Center for Injury Epidemiology and Prevention at Columbia University. The content, though, is solely the responsibility of the author. Injuries and disasters exact an enormous toll on population health and well-being. Public health practitioners and epidemiologists can contribute to controlling and preventing the physical and social consequences of injuries and disasters by collecting, analyzing and interpreting data to help guide control and preparedness efforts. As population health scientists we are challenged to more broadly define injuries to include behavioral and mental health outcomes, utilize non-traditional and forward-thinking research methods, and structure innovative control and treatment programs based on evidence. I hope to help contribute to this process by presenting access to background material, disaster and injury-related studies, recent presentations and lectures, descriptions of and links to related sites and epidemiological tools. I also use this site to host a number of workshops I teach on epidemiology and related methods. The site is organized into substantive and methodological sections. There are overviews, articles, resources and links related to disaster epidemiology and to injury epidemiology. The methods sections contain materials for an introductory course in epidemiology, presentations and workshops on the use of R in epidemiological analysis, the practical application of SAS for public health research, an introduction to spatial analysis for epidemiologists and an overview of statistical tools for epidemiologists. There is also a section of the site for material unrelated to disasters or injury. To navigate the site, use the tabs at the top of the pages. Some pages have sub-headings. Comments and suggestions on any aspect of the material presented are most welcome. A contact link is at the bottom of the page.